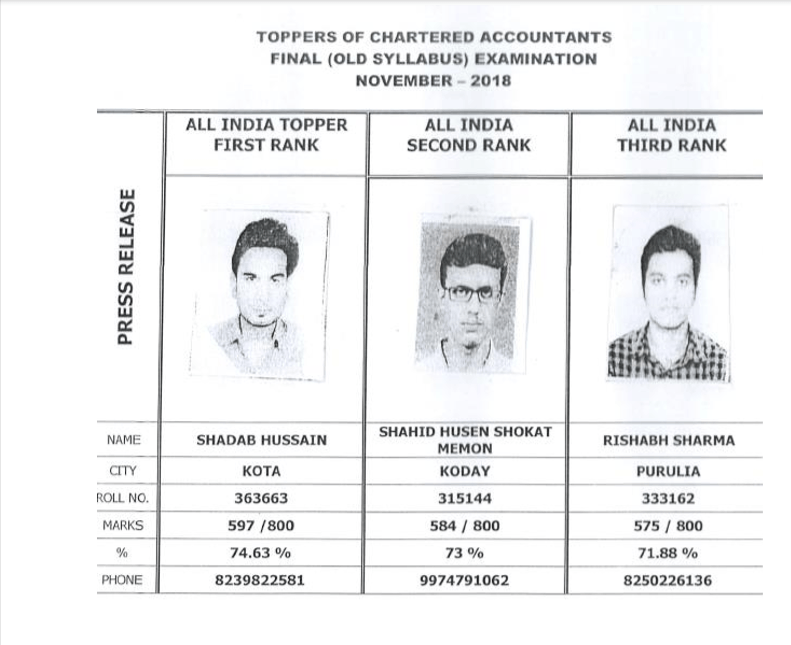 Finally, the much-awaited result for CA Final Nov 2018 has been declared by ICAI on 23rd January 2019 for both old and new course along with CA Foundation and CPT Result. There is an increase in pass percentages trends in ca final both courses results as compared to May 2018 attempt. Check out on this page ca final latest and past attempts toppers lists and details, their marks sheets, their interviews, and strategy. Under CA Final old course, 13909 students cleared the exam out of 109016, while out of 15503 new course registered students, 1060 cleared the final milestone in November 2018. 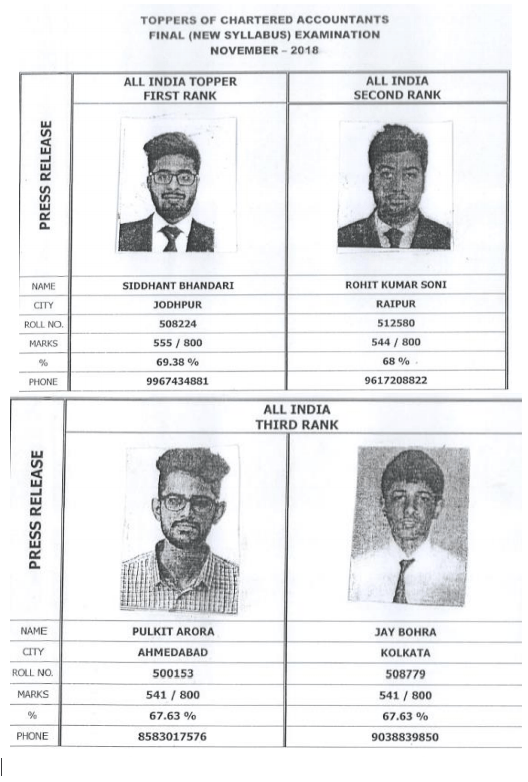 CA Final Nov 2018 toppers from Old Syllabus- The Kota boy Shabad hussain become AIR 1 in ca final November 2018 examination with 74.63%. Shahid Husen Shokat Memon ranked 2nd with 67.63% and Purulia secured AIR 3 with 71.88%. Check out the toppers complete detailed in the following table. 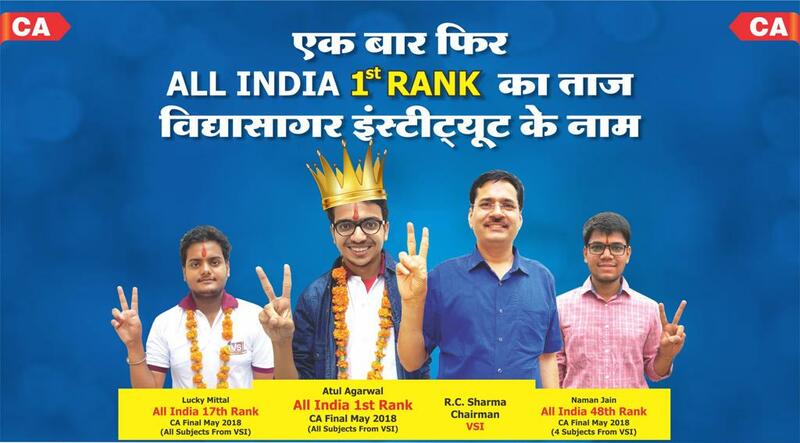 VSI has proven the best CA Coaching Institute throughout India by giving AIR -1 in CA Final May 2018 Examination by Atul Agarwal. VSI has proven that nothing is impossible if studied in proper guidance and with proper planning. Mohit Gupta secured the position of AIR -1 with 587 marks out of 800. The second rank holder is Prashant who secured 571 marks out of 800. 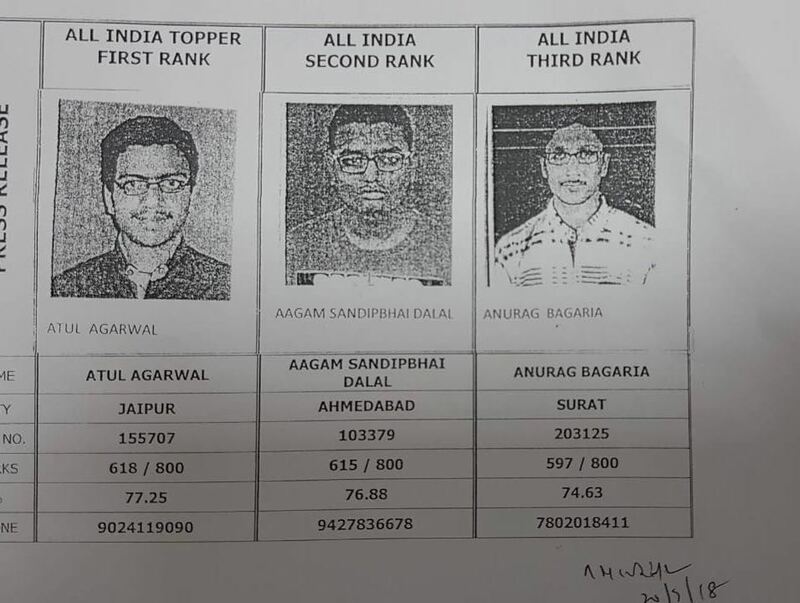 Aditya Mittal was the third rank holder who save this position by attaining 565 marks out of 800.